Yesterday’s down candle on the usd to cad daily chart, reinforced once again the bearish picture for the pair, with bar closing with a narrow body and small lower shadow, suggesting that there may still be some US dollar bulls in the market despite the overall picture. With all three moving averages pointing lower and with the 9 day now crossing the 40 day moving average, these indicators once again confirm the bearish tone. This may well continue as we move into an interesting period for the usd vs cad in the next few hours, firstly with an interest rate decision for the BOC due shortly, and then with two days of testimony in the US by FED chairman Ben Bernanke, so expect some volatility and plenty of trading opportunities both today and tomorrow. If we take the first of these items of fundamental news, it is widely expected that the Bank of Canada will keep its benchmark interest rate at a record low today, based on the strengthening Canadian dollar which could threaten a recovery that has been stronger than policy makers expected. The affect of Bernanke’s statements over the next two days are less clear cut, as the markets now wait for his testimony to start. 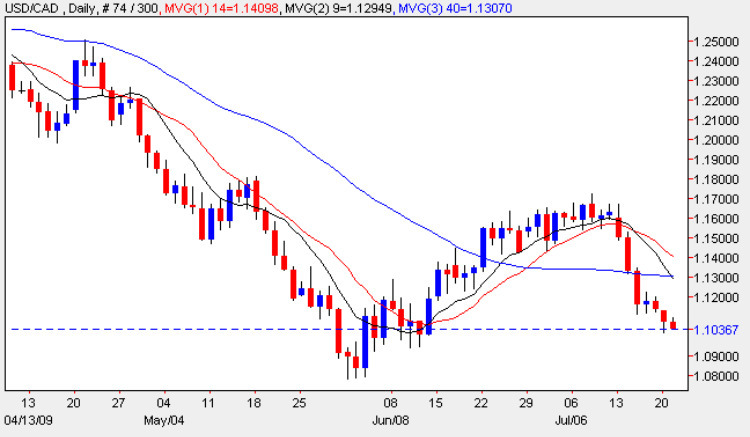 As always it will be wide ranging and cover all the economic and fiscal policies of the FED, and if the statements are viewed as a positive outlook for the broader economy, then this could weaken the US dollar still further, sending the usd vs cad down to retest the 1.08 level once again, with the potential for a much deeper move in the medium term. Whether we reach parity again is debatable, but the next two days will be seminal ones for the usd vs cad in the short to medium term.